Originally published in Crochet! 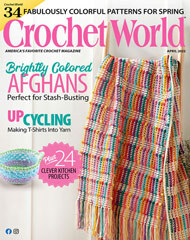 magazine's March 2010 issue, this cozy, crochet hooded scarf was inspired by the Irish hellebore wildflower. It's a great pattern to use make crochet projects for charities. Size: Includes girl's small and large. Made with medium (worsted) weight yarn and sizes H (5mm) and J (6mm) hooks.